Kingdoms at War • View topic - Introducing Trading! 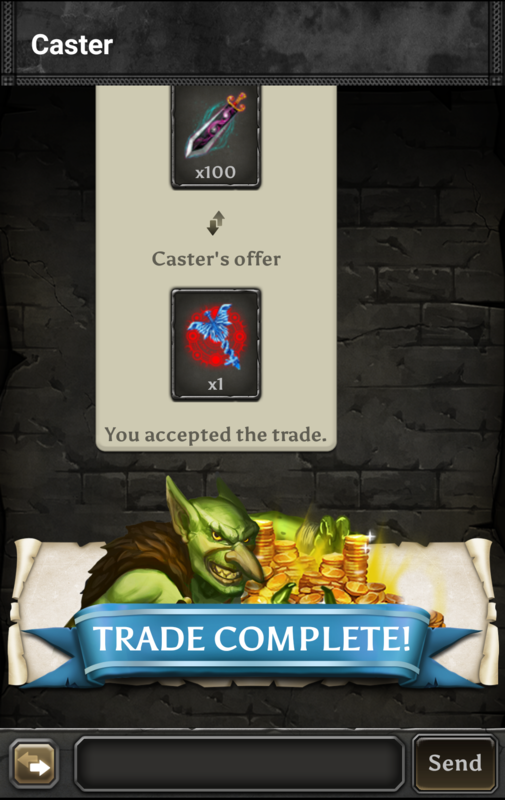 Today we're happy to introduce the Trading feature in Kingdoms at War! It will be rolling out to the App Store, Google Play Store, and Amazon App Store over the next day or so, so keep an eye out and don't get too antsy if your friends get it first. You can always farm them while you wait. Using Trading you'll be able to trade select items between you and your Friends. 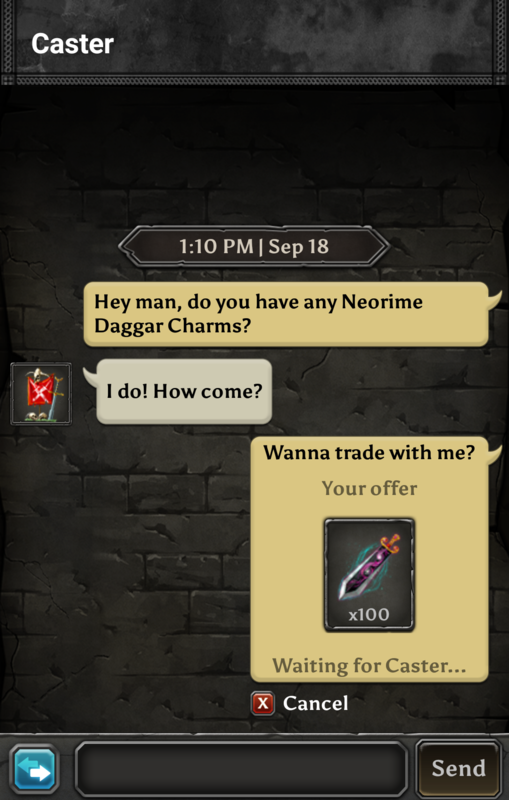 The trading menu is available by tapping on the trade icon to the left of the chatbox in a Private Message conversation. The little button to the left of your chatbox is the trade button that will allow you to initiate a trade with your friend in chat. Choose what you're willing to offer in the trade and send a request. Your follower will then be able to choose to accept or decline the trade. 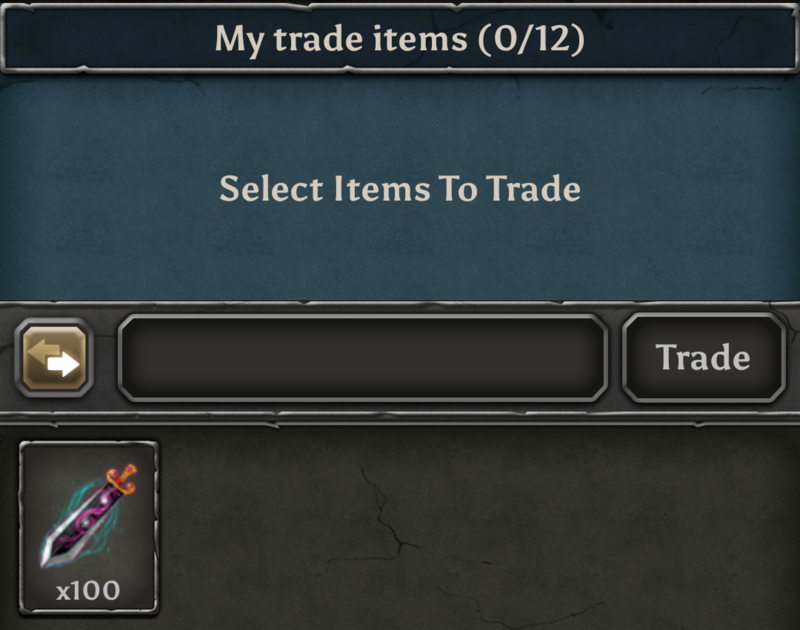 If they accept, your follower will be able to add some of their items to the trade. After they've added their counter offer and choose to trade the player that initiated the trade must confirm the trade before it is completed. You can trade Charms and items that appear in the Rewards section of your Showcase. Can I undo a trade? All trades are final. ATA is not able to step in with regards to trading disputes. You should always be a hundred percent certain that you are okay with the terms of a trade before committing to it. How many items can I trade? You can add up to 12 unique items per trade, and are able to specify the quantity of each of these items. The quantity itself doesn't have a limit. You can trade with any of your Friends. Note that while there is no limit to the number of trades you can make, you may only have 3 ongoing trades at any given time. Believe they will trade for real cash. BAd thing to introduce. Time to make a bunch of alts and trade for those free xtals. Another useless update that'll be exploited,I'd like to know where the promised new eb series is,it's only been promised by support for the last 3/4 months now,but all that's come out is the $$$$$ ones.